We’d heard good things through the grapevine about Pendolino, so when we read about the ‘World Dinner’ they were hosting during Crave, we quickly booked in. 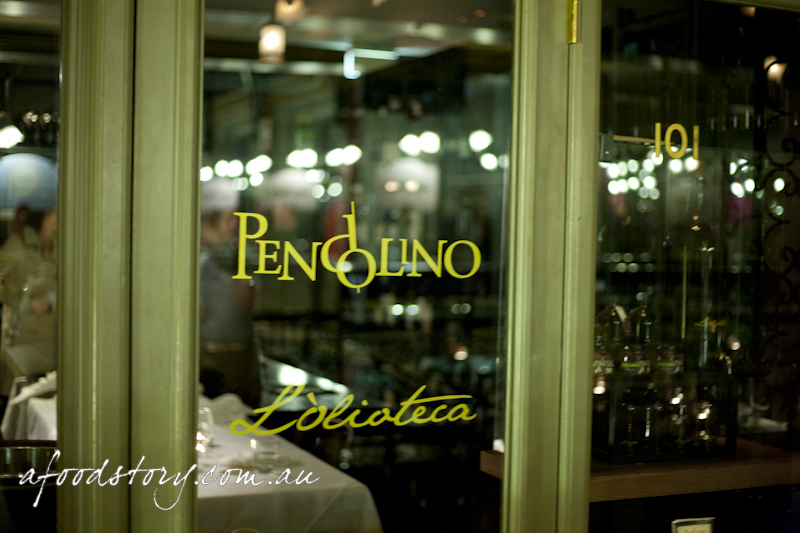 The degustation menu was inspired from the time head chef Nino Zoccali spent in the north-east region of Italy called Trentino-Alto Adige. The region sits in the very north of the country, right below Austria. Trentino is the southern part of the region, while Alto Adige (or South Tyrol) is the northern part. As my mother is Austrian hailing from Tirol I was curious to see what influence the Austrian background would have on the ‘Italian’ cuisine. The lift stopped on level 2 and directly outside stood the front desk and maître d’. Lex mentioned we had a booking for 4 people at 7pm and was asked what name the booking was under… nope couldn’t find it… was it definitely under that name?… yes we were sure, and no he still couldn’t find it… was it definitely a booking for Pendolino? Thanks for making us feel like idiots thinking we may not have booked correctly, but you would think we would know what restaurant we booked. After being told several times the booking wasn’t there Lex began flicking through her phone to find the email to show the ticket for the booking. All of a sudden the light came on and he said “Oh, you’re here for the degustation, wait over there they are still setting up”. Thanks, no thought to check that list too, we found it quite rude and not a great start to the evening. 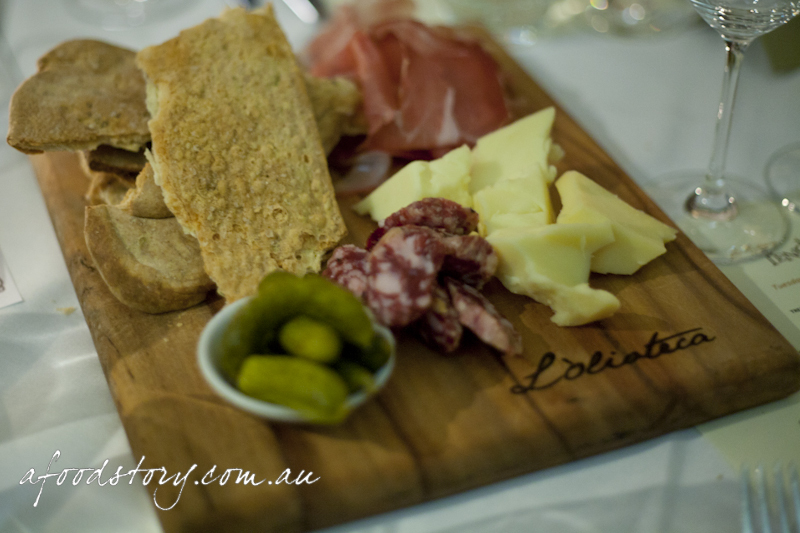 Antipasto alla Trentina – Trentino style antipasto of freshly sliced speck, cured wild boar sausage and stelvio cheese with pickled baby cucumbers and house made fennel seed rye bread. The stelvio cheese was definitely a winner, absolutely loved it as did most people at our table. Quite strong cheddar like flavour but with a softer supple texture. Speck was rich and delicate, melt in the mouth style. I thought the wild boar sausage was spot on having a slightly gamey taste and I could not be happier with the pickled baby cucumbers. The bread was an unusual style of flat rye bread with fennel seeds throughout bringing aniseed flavours to the mix. 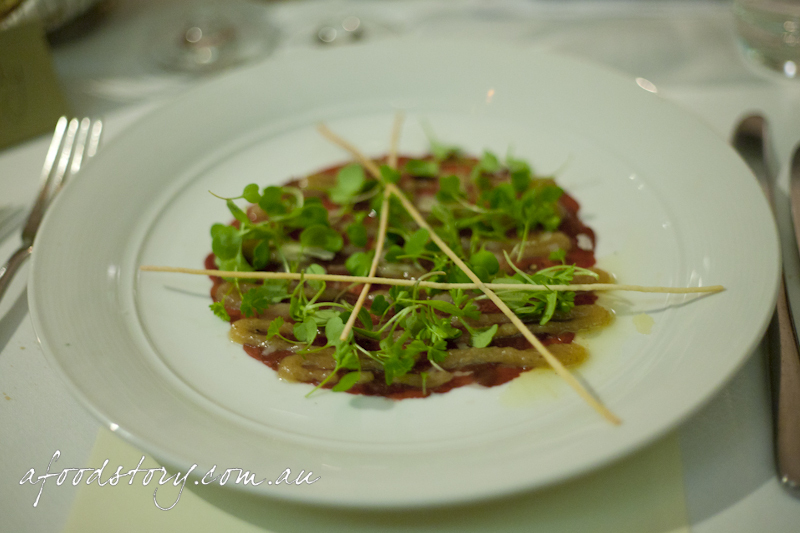 Carpaccio di cervo – Carpaccio of Mandagery Creek Venison with Truffled White Walnut Puree, Grana Padano Cheese, Rocket Cress and Handmade Rosemary Grissini. Having had quite a few carpaccios but never one of venison I was looking forward to seeing what I thought of it. It was so thin it was almost transparent, seasoned brilliantly and so delicate you could separate it with just a light touch. The bread sticks were easily the thinnest I have come across and they did their part quite nicely. We found the truffle and walnut puree was a bit too overpowering for the delicate meat in both terms of taste and texture. Raviolini alle erbe – Handmade Mountain Herb and Cheese Baby Ravioli with Traditional Cheese and Butter Sauce. Butter sauce with sage is one of our favourites (might even go so far as to say my personal favourite pasta sauce), as it pairs so well with pasta. 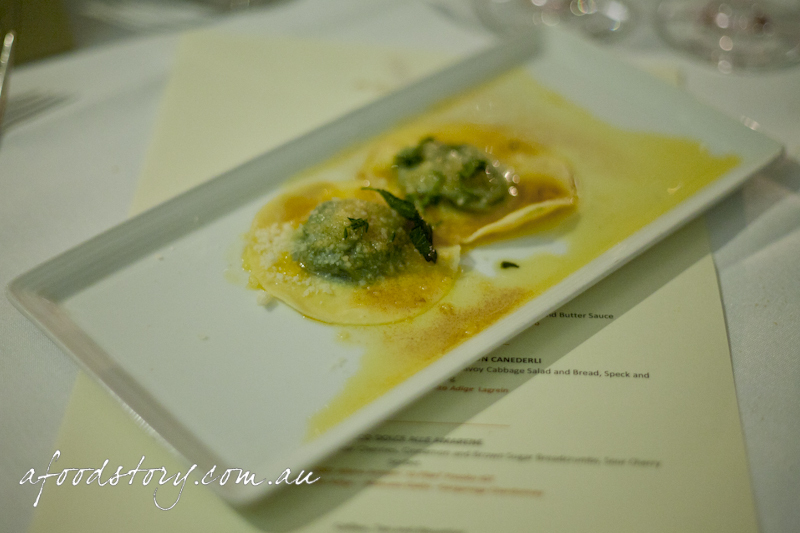 The herbs were punchy with their cheese filling, the pasta was really marvellous, so delicate and cooked perfectly. While not the smallest ravioli out there I think having a third one may have made this dish seem like more of a complete course and not a light nibble. 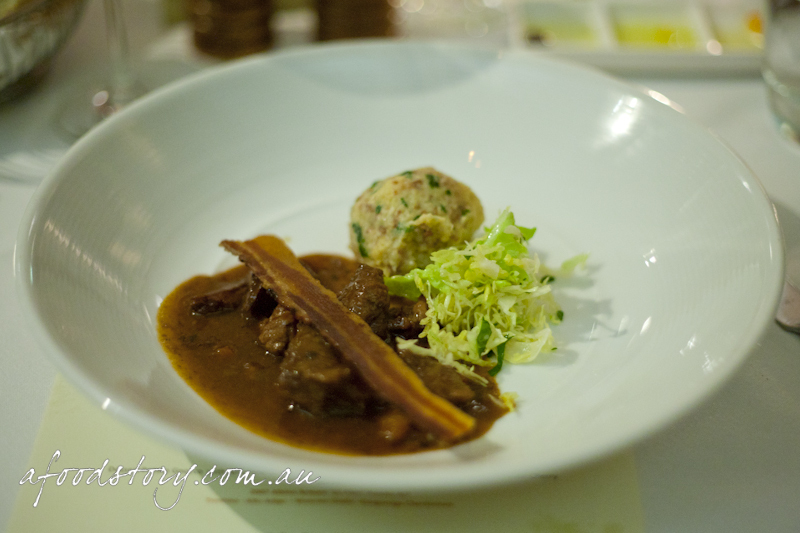 Brasaro de manzo alla Altoatesina con canederli – Alto Adige style Red Wine braised Blackwood organic beef with savoy cabbage salad and bread, speck and parmesan dumpling. The beef was soft and tender with a robust goulash feel to it, the dumpling was nice and fluffy but not nearly as flavoursome as ones I remember my Nan used to make. The little cabbage salad was a nice break from the rich dish but it just didn’t compare with the amazingness that is buzo’s cabbage salad. Still not too sure on the speck that was fried/grilled to become something akin to a speck flavoured prawn cracker. Gnocco dolce alle Amerene – Dessert Potato Gnocco with Amarene Sour Cherries, Cinnamon and Brown Sugar Breadcrumbs, Sour Cherry Sorbet. This was a real hit. I’m a huge sour cherry fan but was uncertain if I would like it. While eating it I almost imagined I was eating a cherry strudel in some ways, a deconstructed one at that. Sweet savoury dumpling was a winner, tasty thin custard and crunchy pieces of spun caramel really just adding to the already great combination. 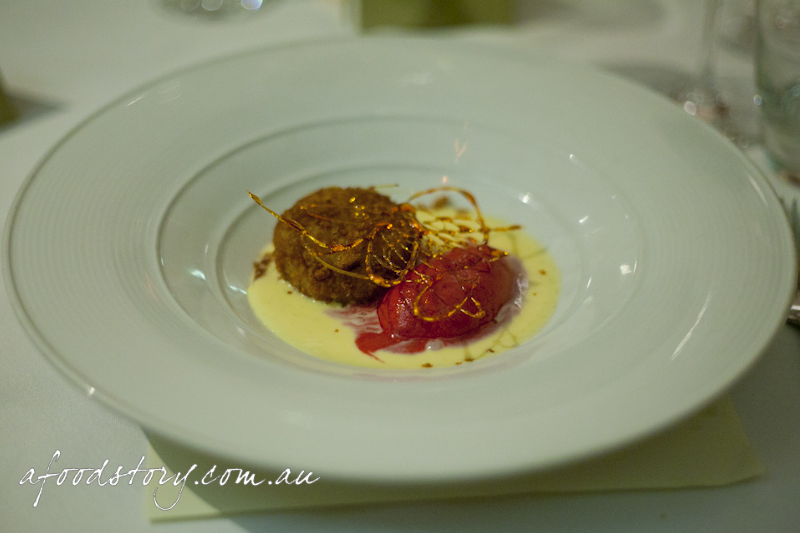 Some guests at our table were unsure about potato being in dessert but it worked so well. Nino had mentioned that ‘pasta’ in Italian actually translates to pastry, so although savoury pasta has taken off, pastry can of course be sweet. As the evening drew to a close we were glad to see coffees being brought around and it was short blacks all round, and thankfully so as Lex was designated driver and it was way past our bedtime on a school night. I didn’t hang around to try the biscottini and snuck out to take a few photos outside. My main gripe for the evening other than the inability to hear Nino or the sommelier Cristian during their explanations was the inordinate amount of time between courses. At first it was something I didn’t even notice but as the night progressed everyone could really feel it drag on. Through the magic that is photography time stamps I discovered that there was no less than a 30 minute break between courses and up to 50 minutes at the longest. For portions on the small side 20 minutes between would have been plenty and we could have made it out well before bedtime. We didn’t really think it was worth the money to be honest, having communal tables meant they could cram in quite a lot of people (10 at ours) and the portion sizes were relatively small. I wasn’t full by the end and thought the wine would have been more free flowing. Enjoyed the night but it didn’t exceed my expectations. Very well said re: the bad beginning I thought it was very poor service since they had a big event on that night & they did not even think to look at the second list. We were made to feel like we were not welcome. I will not be back anytime soon. It’s very disappointing that front of house ruined it for the restaurant. When we went to Sepia we were warned about the wait In between the courses at the beginning. I did enjoy some of the dishes the combined table was weird as we were sitting next to a very odd couple one of which did not stop talking all night. Fav dish was the raviolini & the gnocco dolce dessert. I’d like to go back and try their standard menu, but am hoping the maitre d’ might not be so rude next time! Don't miss a thing! Enter your email address to receive notifications of new posts by email. Copyright © 2016 A Food Story. All rights reserved. This work is licensed under a Creative Commons Attribution-NonCommercial 2.5 Australia License.